These powerful quotes began a wonderful book marketing seminar I attended recently with Sheri Fink, a #1 international best-selling, award-winning children’s author and creator of “The Whimsical World of Sheri Fink” children’s brand. Sheri writes books and gives talks that inspire and delight children while planting seeds of self-esteem. She is also very generous with sharing her best practices, as she has an extensive background in marketing. No matter how you come to the table as an author, marketing is going to be a certainty for the duration of your career. How can we turn marketing into a labor of love? Sheri advises authors to “Write the story your heart wants to tell.” Although she enjoyed a very successful career in corporate America, her dream was to encourage and help children through writing. Sheri was able to leverage her work experience into a successful book launch, and within a few short years, her series has evolved in ways she never dreamed would happen. For example, she was approached by a playwright from Washington, D.C. who wanted to adapt one of her books for the stage, because he believed in her product. Over the course of a year, he shopped it around until a theater in Tennessee picked it up. It is now in production and will be playing to audiences in the near future. During the seminar, Sheri emphasized the importance of graciousness and authenticity when interacting with readers. Going all out with a focus on creating a special event for the guests will result in a more enjoyable experience for everyone. At a recent festival in Mission Viejo, author Dean Koontz stayed hours longer than he was scheduled to attend a book signing. Why? Because he still had fans waiting to speak to him. Mr. Koontz posed for pictures and even put someone’s pet poodle on the table for a photo opportunity. This kind of attitude goes far in keeping fans for life. The secret of your success will always be people, so grow your network and always add value for others. Be willing to give first. Know your readers and customers. When someone tells you they like your book, ask for a review. Make it easy for people to help you. Be specific in your request. Write and provide the campaign copy in advance. Always thank the people and share the result of their efforts, because books are marketed best by word of mouth. Your fans will always be your top marketers, so nurture and reward them in ways they will appreciate. Think of yourself as the CEO of your own business and have an entrepreneurial mindset. Your work space will be important, so create space for what you want to come into your life. Establish a physical environment that’s conducive to your best writing. Set up a schedule to support your writing, publishing, and marketing goals. Come up with a consistent font and a brand, an umbrella under which all of your projects can be covered. Be strategic in your marketing efforts. Leverage your books into a brand and promote the whole line. Find a mentor and / or coach. Create or join a mastermind group, which is a set of 5-6 people who have phone conferences. In these meetings, the group asks each other for assistance, shares accomplishments, and provides feedback. Be sure to leverage ideas from people with diverse backgrounds who are from different parts of the world. Hire interns to help you (pay them, set expectations, set goals, and let them know what they are getting out of the program you create). Give them a confidentiality agreement. At all times, show professionalism. In closing, Sheri acknowledged that It takes a lot of courage to build your wings on the way down, but if you’re going to dream, then dream big. Don’t let let other people’s limitations limit you. Play to win – be fearless and take action, because you never know when you’re going to catch an elusive breeze that allows you to take off and soar to new heights. Sheri Fink’s first book, The Little Rose, was a #1 best-seller on Amazon for over 60 weeks, became the #1 Top-Rated Children’s eBook on Amazon, and won a gold medal in the Readers Favorite International Book Awards. 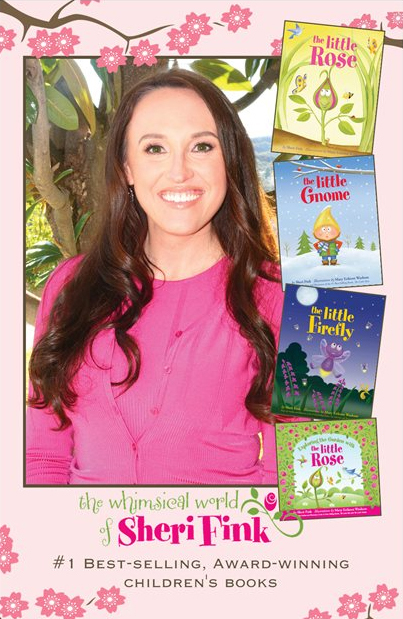 Her subsequent books, The Little Gnome and Exploring the Garden with the Little Rose, debuted on the Amazon best-seller list. This entry was posted in Encouragement, Marketing and Promotion, Publishing, Writing and tagged book, Dean Koontz, marketing, Ray Bradbury, Sheri Fink by Kimberly Vargas. Bookmark the permalink. Thanks, Kimberly, for the wonderful information and inspiration–great food for thought! Great info! I especially love the part about being gracious and generous with your readers. That seems like a perfect way to turn readers into lifelong fans.